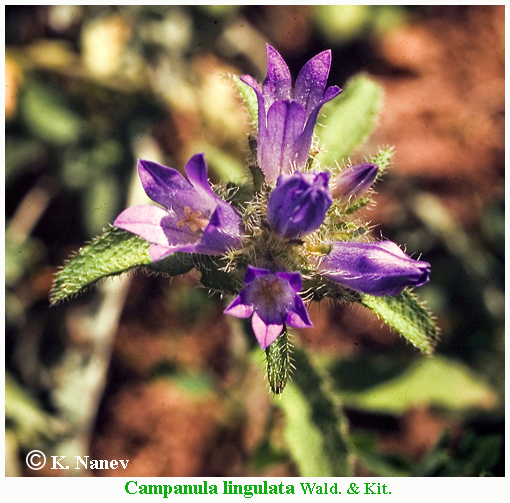 Species: Campanula lingulata Waldst. & Kit. Biennial plant. Root spindle, more or less bold, slightly branched. Stems several, 20 - 30 cm high, ascending, simple, rarely branched, ribbed, scattered to thick bristly; bristles 0.5 - 1.7 mm long. Basal leaves 25 - 80 mm long, 5 - 15 mm wide, wide to elongate shovel-like gradually narrowed in the wing stem, the edges shallow wavy, serrated on top rounded, bristly fiber; Stem leaves sessile, elongated shovel-like to lance, (15) 25 - 80 (100) mm long, (4) 5 - 15 (20) mm wide, evenly to densely bristly fiber, along the edges of shallow wavy jagged. Inflorescence headed, at the top, at the base with a envelope of prickling. The flowers are sitting down, rarely the flower stem is branched, and the inflorescences on the tops of the branches. The prickling are deltoid, bristle-like, on the edges shallowly unevenly serrated. The calyx between the shares with backward appendages; calyx shares oblong, 6 - 7 mm long, 2 - 2.5 mm wide, grooves; appendages ovoid, 5 - 6 mm long, 3 - 5 mm wide, grooves, slightly longer than the ovary, by the the fruit grows. Corrolla funnel, 18 - 30 (35) mm long, violet or pale violet. Stamens 8 - 12 mm long, with wide, long grooved stems. The box is about 5 millimeters long, broadly conical with three-pointy side walls, located near the base. Seeds of irregular shape, 0.7 - 1.1 mm long, brown, on the surface with small warts. Flowering Time: Blooms: V - VIII, fruitful: VII - IX. Distribution in Bulgaria: Grow on dry stony and rocky places, on shallow and eroded soils mostly with a silicate rock bed, in the hilly plains, in the foothills especially in the oak belt, in communities of Quercus cerris, Q. frainetto, Q. pubescens, Carpinus orientalis, Fraxinus ornus and others. Propagated from sea level to 1500 (1700) m altitude., (Conspectus of the Bulgarian Vascular Flora) = conspectus&gs_l= Zlc. Distribution: Southern Europe (Balkan Peninsula, Southern Italy, Romania).